Adrian Velazquez, 19, of Kearny, died Saturday morning from injuries in a crash in Delaware City. Wale Aliyu reports. 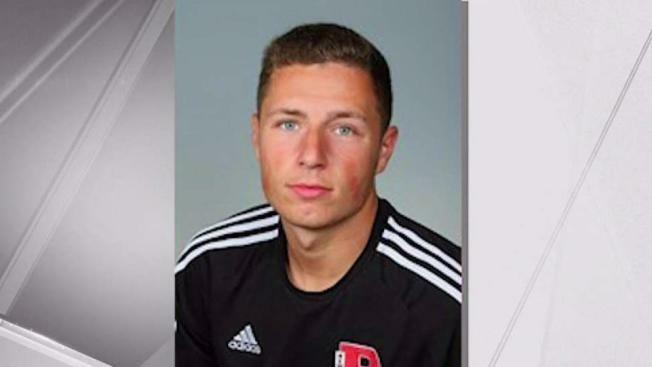 A Rutgers University-Newark soccer player and a friend from New Jersey were killed -- and two other members of the team were hurt -- after officials said they were involved in a car accident on their way back from picking up a puppy in Delaware over the weekend. Adrian Velazquez, 19, of Kearny, died Saturday morning from injuries in a crash in Delaware City, university officials said. A friend who did not attend Rutgers but had graduated from St. Benedict's Prep in Newark, Alfahtee Huey, was also killed. Rutgers-Newark sophomores Jose Barillas of Newark and Andres Medina of Howell, both of whom are also on the Scarlet Raiders soccer team, were also injured in the crash. The puppy, a black Lab, was also killed in the crash. The friends had just picked up the dog and were making the three-and-a-half hour drive back when they crashed on Route 13 at around 10 a.m., Barillas told News 4 on Monday. Velazquez and Huey were pronounced dead at the scene. "I cannot even begin to tell you, if you are a parent, this is the worst nightmare any mom or dad could go through," said Tania Rivero, Velazquez's mother. "Adrian was just beginning to explore his academic interests to select a major, but was as committed to success in the classroom as he was on the soccer field, where he was a defensive anchor of the men's soccer team whose play for passion exuded his passion for the game," said university Chancellor Nancy Cantor. "He inspired deep affection among his teammates and classmates, as well as in his hometown, with which he maintained strong connections." Rutgers is offering counseling for community members at their campus counseling center in Newark. Police believe Velazquez fell asleep at the wheel. The Jersey Journal reports he was wearing a seat belt when the car veered into the right lane, then off the road into the grass, where it hit a "small rise in the ground" and went airborne. Drugs or alcohol did not appear to be factors in the crash. Huey was not wearing a seat belt. Andres Medina's mother, Vivian Mejia, told News 4 over FaceTime that Jose Barillas saved her son's life. Barillas said he'd just stayed by his friend's side, helping him to breathe and stay up "because he kept trying to lay down." Medina's lungs are "looking better" but he is not out of the woods yet, Mejia said: "We are just by his side." Velazquez is survived by his father, mother and two brothers. A wake is planned at the Thiele-Reid Family Funeral Home in Kearny on Thursday evening, and a funeral mass is being held at St. Cecilia Church in Kearny on Friday. In lieu of flowers, his family has requested donations to a memorial scholarship in his name.